Dan Martell is an exciting guy. He’s been mentor at 500 Startups and an investor in more than 30, including Udemy, Intercom and Unbounce. He’s helped to found and raise capital for the startups Clarity and Flowtown, and is now a world-renowned business consultant (and, who are we kidding, an impressive adrenaline junky on top of it). Dan’s exit popup is done really well. 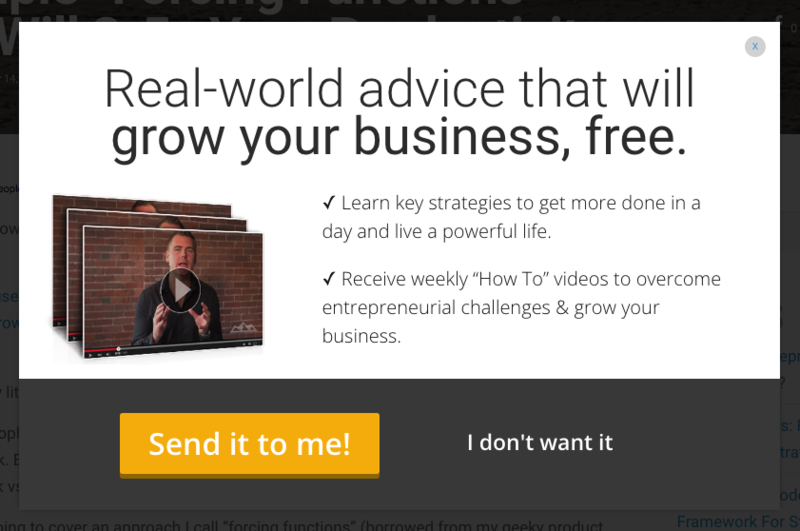 The value proposition, of “Real World Advice that Will Grow your Business” is awesome. Plus the three video stills and the two simple bullet point list items detailing exactly what you’ll receive, plus the negative CTA which makes you feel like an idiot to select? 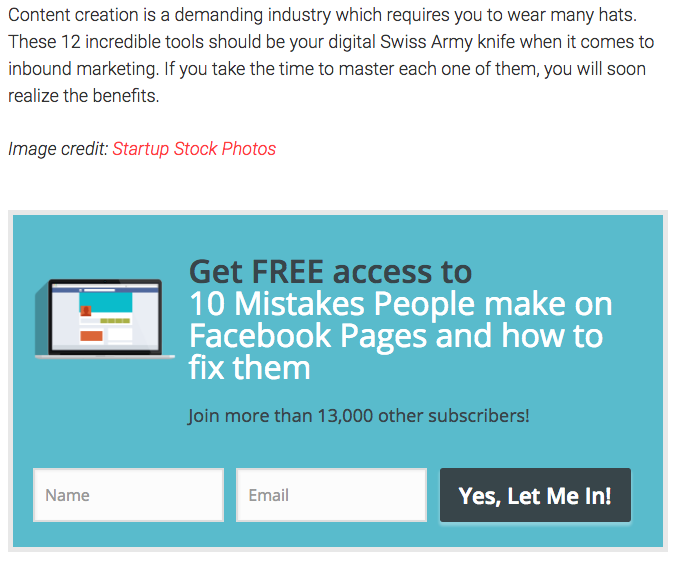 If you’re going to add an exit popup to your blog (which you should) this is a great one to be inspired by. Focus on adding more value than anyone else in the world and you will build an incredible active and engage list. Make it about “converting more optins” and you’ll loose before getting started. Create value first. Positionly is a software company from Warsaw which is quickly making a name for itself in the inbound marketing space. Their software provides your business with an in-the-moment dashboard of your search rankings, keywords and traffic. They give you advice about how you can rank better and attract more traffic to your site. 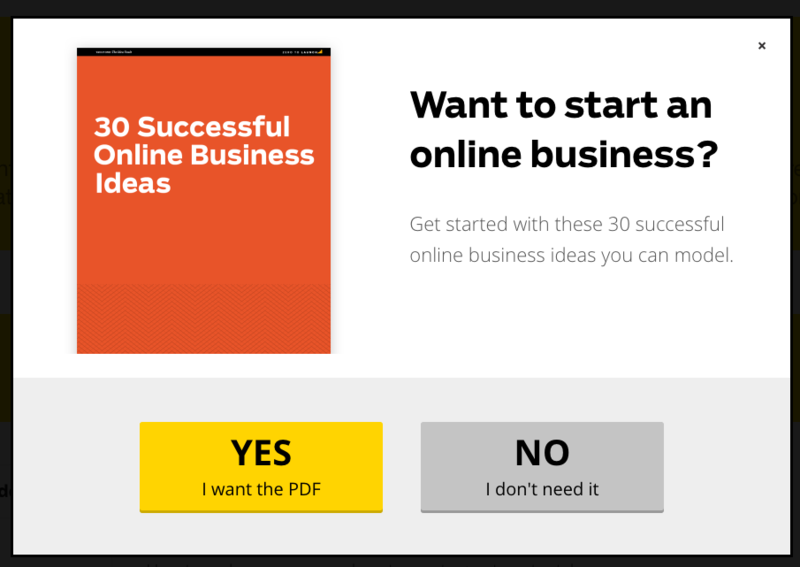 I actually like the confidence of Positionly’s subscription popup. 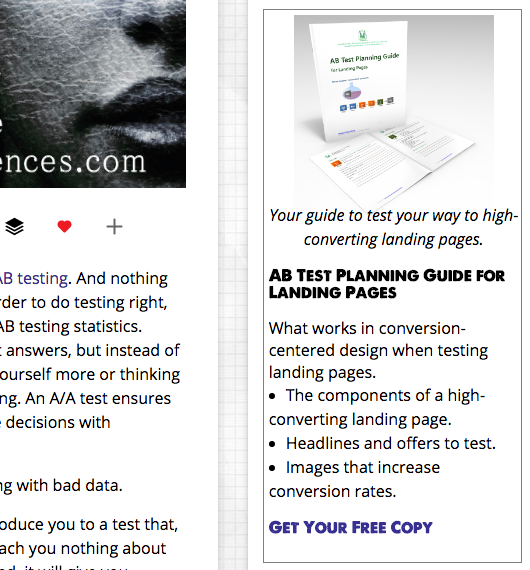 I like “The Best SEO Tips” and I like the CTA “Subscribe Now!” – so long as they’re both tested. Readers like confidence. They like knowing that whatever they’re in for is done by professionals who know their stuff. Based on my experience as a content marketer, I focus my efforts on creating high quality, educational content that is well-optimized for SEO, specifically, strategically chosen keywords. This way, articles perform well in search results and drive a decent amount of organic traffic to our website. 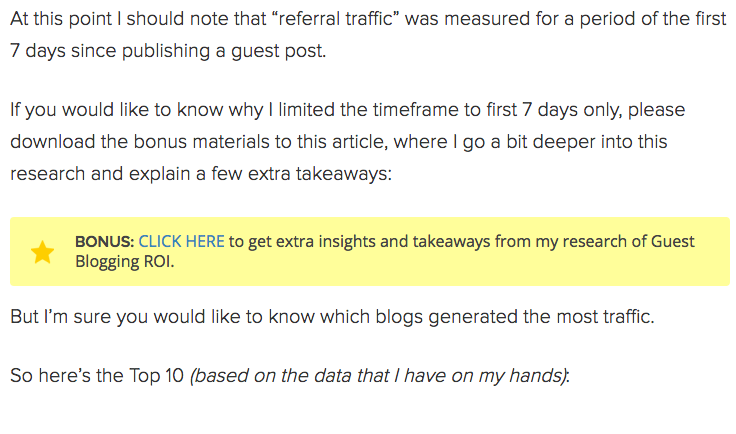 One lead generation method that I usually rely on is sneaking a few offers into well placed locations in a blog post. 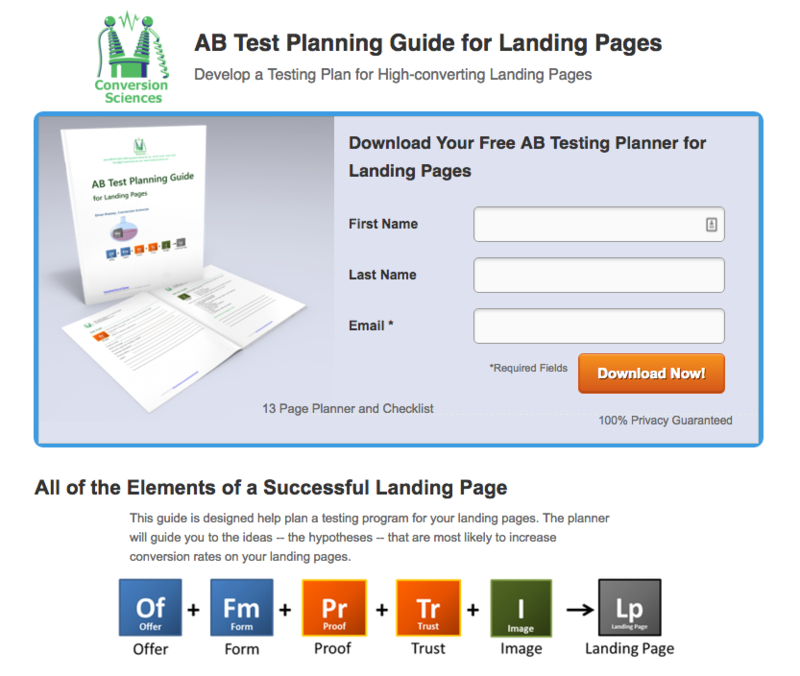 I place links to landing pages and calls-to-action within the copy of the posts, usually in the navigation or sidebar. 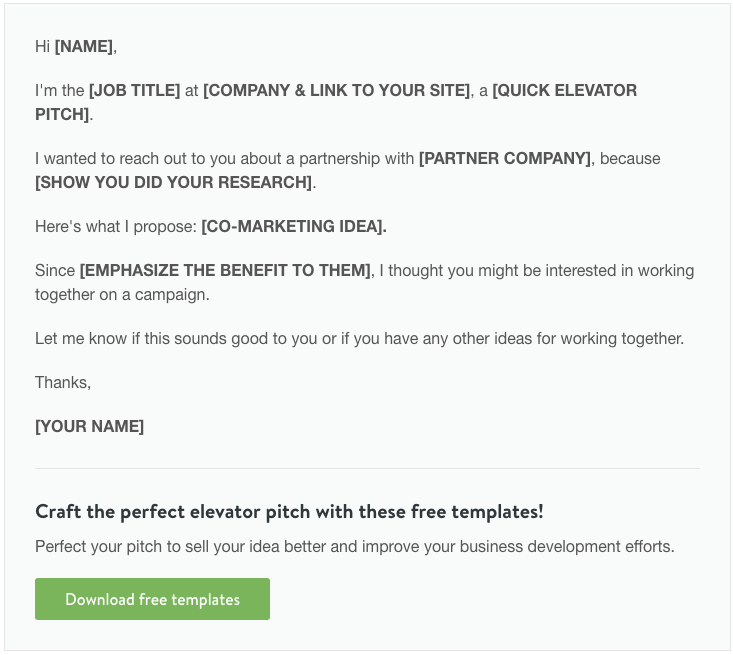 The calls-to-action are both in visual and textual formats. It’s necessary to make them stand out and continually test their outcomes in order to discover the perfect location for them to be placed in. These offers are downloadable e-books that are sent to the prospect’s inboxes once they subscribe to our mailing list. In my writing, I also try to gently refer to the product and add a subtle incentive to sign up for a free 14-day trial to let people test out our application. Frequently, we also initiate cross-promotions. They include guest post and newsletter exchanges. Quora is a Q&A platform where anyone can post a question and get answers from experts in the community. From Ashton Kutcher to President Barack Obama, many have taken their turn in writing answers. After speaking with people from some of the top SaaS companies, I learned that in Poland, Quora is an excellent source for long term traffic. No matter how old the post on Quora is, you can get traffic from it. If you’re good at what you do, Quora lets you establish yourself as the authority on those subject matters. Last but not least, always make sure to create a traffic-optimized profile in order to get people to visit your website, blog, etc. Veravo was started by James Reynolds in 2010. An online marketing agency with over 100 clients under management, James and the Veravo blog focus on driving traffic. The website analysis is likely done manually by James or an assistant, which is an excellent way to learn more about your leads before reaching out to them. It’s a very straightforward lead generation process and makes a lot of sense for agencies and consultants. 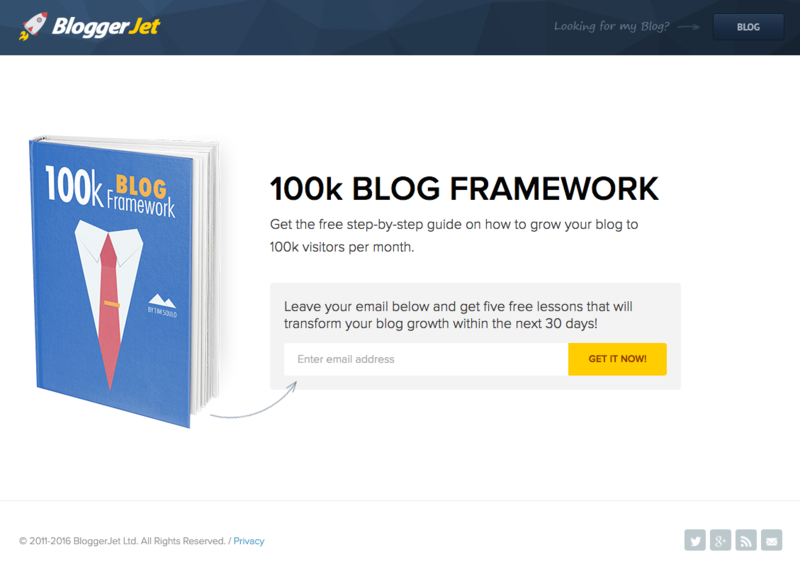 A list building cheat sheet. A list building resource guide. A video explaining showing how you’ve used the top list building strategies. Shopify is the number one ecommerce site platform. It gives you control over the look and feel of your online store by providing hundreds of themes. Their dashboard allows you to add new sales cahnnels, manage products and inventory, fulfill orders and track sales, all from one place. Their blog and resources are built around getting the most out of your online store. In the past, I’ve been particularly impressed with their step-by-step, actionable walkthroughs for getting set up. Like Jeff Bullas’ lead generation strategy as well, this works because Shopify’s content already has a high subjective value simply because it’s Shopify’s. There’s only one, but it’s so kickass that it’s worth including in this list. 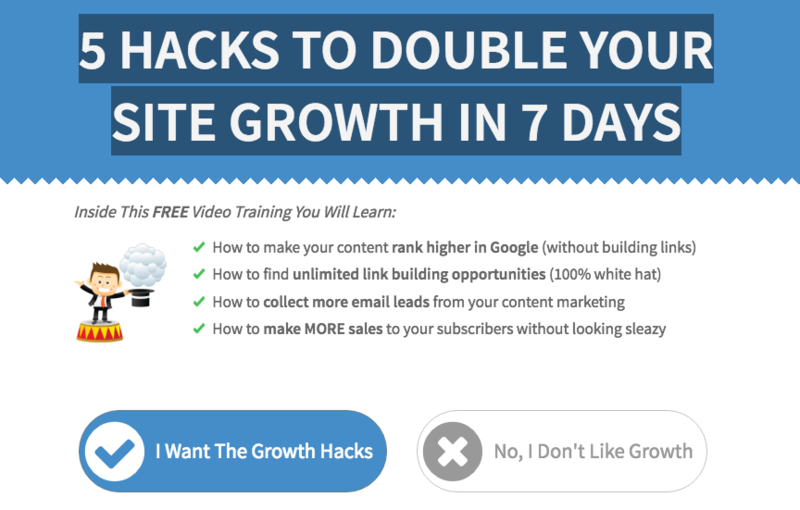 GrowthHacker TV email-gates every video, but only if you try to skip. 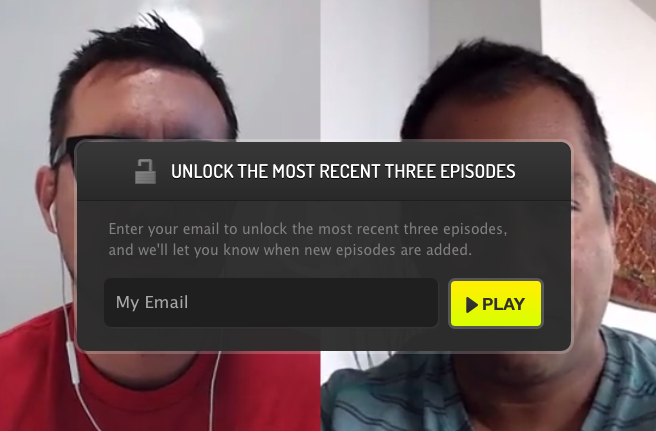 And as soon as you provide your email address, it gives you access to the rest of the video you’re watching as well as three other of the most recent videos. It’s like the most effective scroll or timed popup out there – only appearing once you’ve already received value from the content. Started by Gael Breton​ & Mark Webster in 2014, Authority Hacker was created to give practical advice to entrepreneurs about building their site to where it’s seen “as an authority [you can rely on] to generate income.”Gael and Mark (and their blogger Perrin) are all experienced digital marketers who have helped to build or advise many authority-based companies. The content upgrade overlays you see above are pretty aggressive, until you consider that they’re (while not being quite article-specific) still very relevant to the article’s they’re embedded on. BuzzBlogger (and Wishpond) does something similar by only showing gated content popups on articles specifically relevant to the subject matter. By using a timed or scroll overlay, AuthorityHacker can guarantee that their most-interested readers see their relevant gated content. 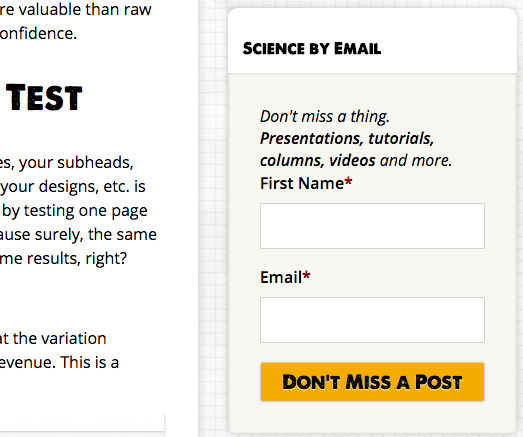 The coolest part about Conversion Science‘s subscription pitch is that they don’t mention articles. Instead, they mention a bunch of stuff you’re not seeing on the blog. 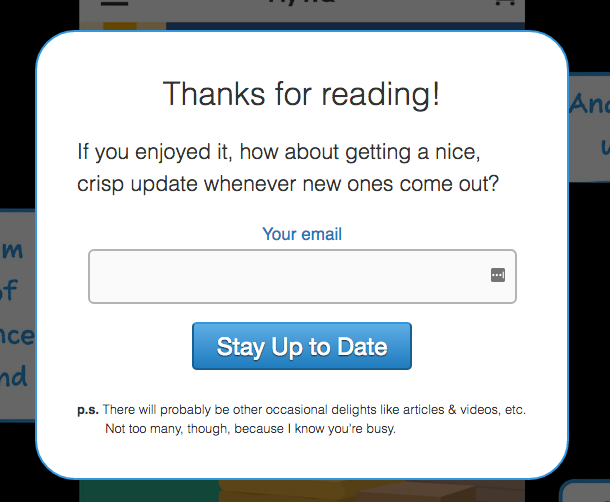 This subtly communicates the idea that subscription gives you way more value than reading the blog does. I’d recommend this: Change the call to action on your mobile (smartphone) site. Your desktop site may offer forms to fill out, a way to purchase, or even interactive tools. We don’t use mobile devices the same way. 1. Use “screenhoppers” to get visitors to come back to your desktop site when they are at their computer. Collect an email on mobile and send a reminder. 2. Reduce the fields in mobile forms. 3. Consider social sign-on for mobile visitors. 4. Let them call. Make sure your telephone links are instrumented for one-press calling. BloggerJet was founded by Tim Soulo, the marketer behind TweetDis and Content Upgrades PRO. He’s now the CMO for Ahrefs (which is exploding, by the way). For me it’s all about that nav bar gated content. Anyone visiting BloggerJet will naturally gravitate towards the nav bar, simply to get a bearing of how they get around the website. 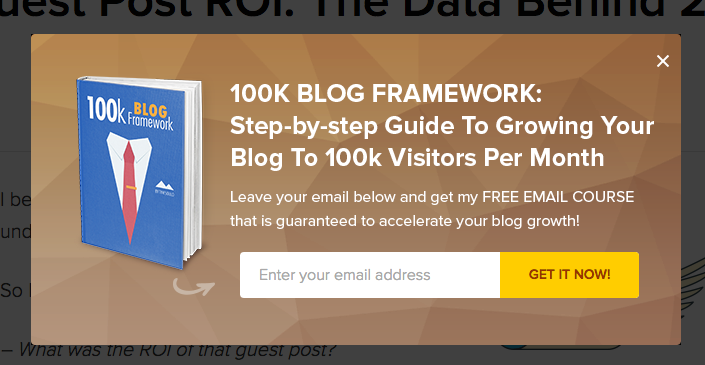 One of the four tabs is “100K Framework,” which, when clicked upon, opens up the gated content landing page you see above. 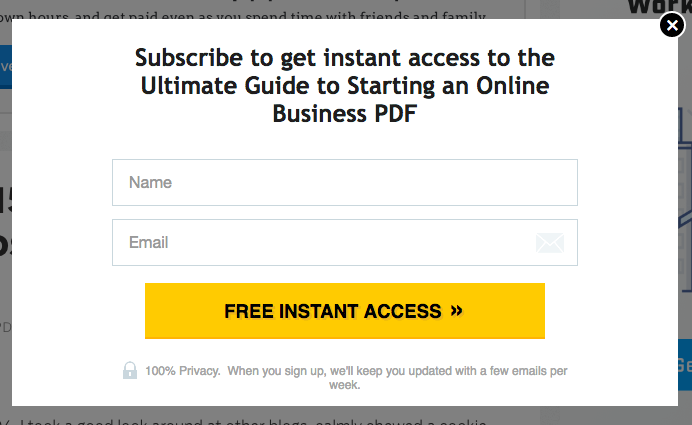 The nav bar promptly disappears, making this a true landing page which is optimized for conversion rates. 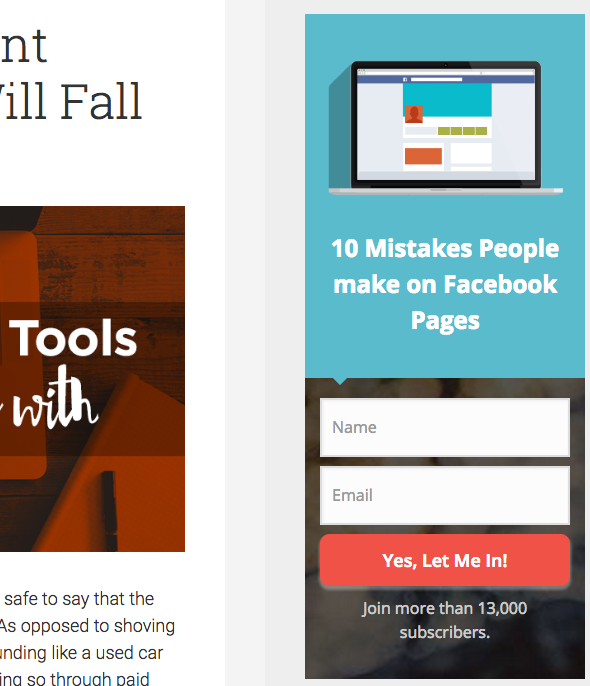 I love the exit popup headline from I Will Teach You. 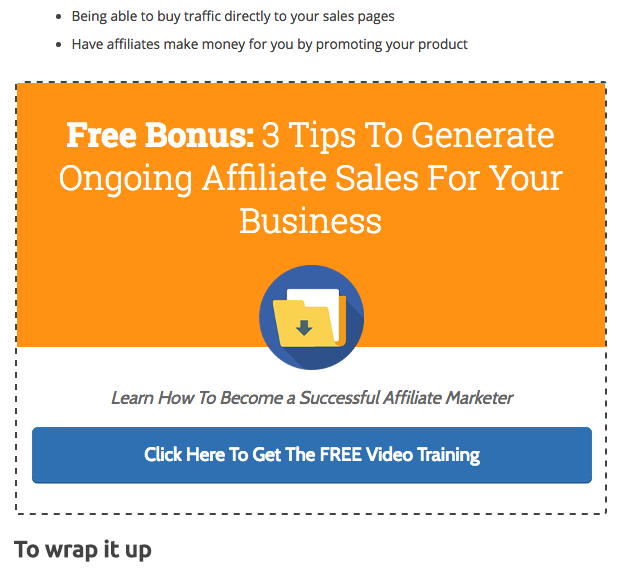 “Want to Start an Online Business?” It very effectively segments visitors. If they don’t convert, then they definitely don’t want to start an online business. If they do, then you automatically know what kind of lead you’re working with. 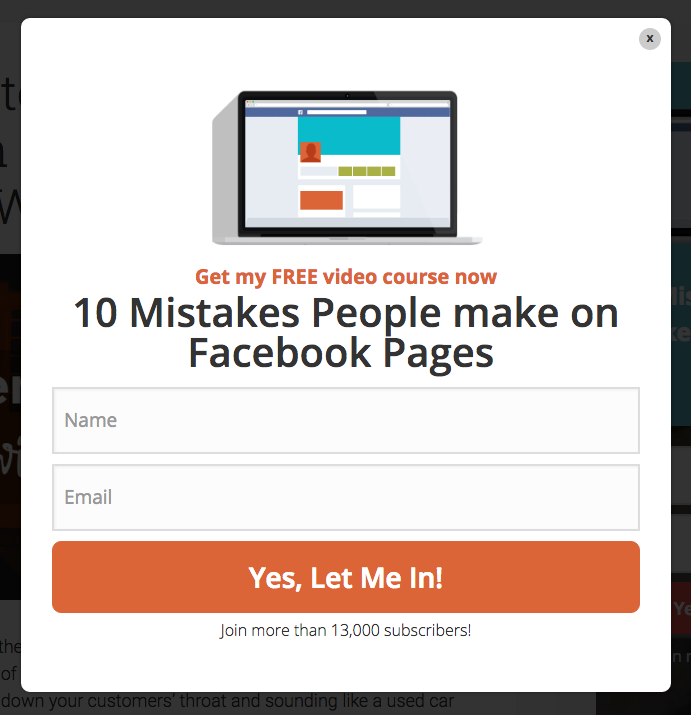 If the gated content was “100 Variables of an Ideal Customer Profile” you wouldn’t necessarily know at what stage your lead was, and have to find other ways to nurture them towards a paid conversion. To keep growing leads consistently, marketers need to stop thinking in campaigns and start thinking in engines. 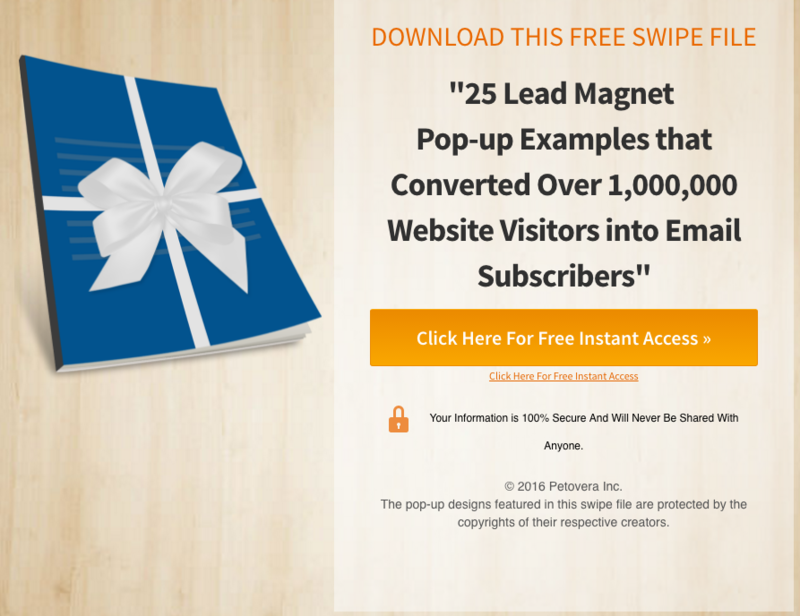 You may have a great campaign that produces a pop of leads and that’s wonderful. But what happens next month? 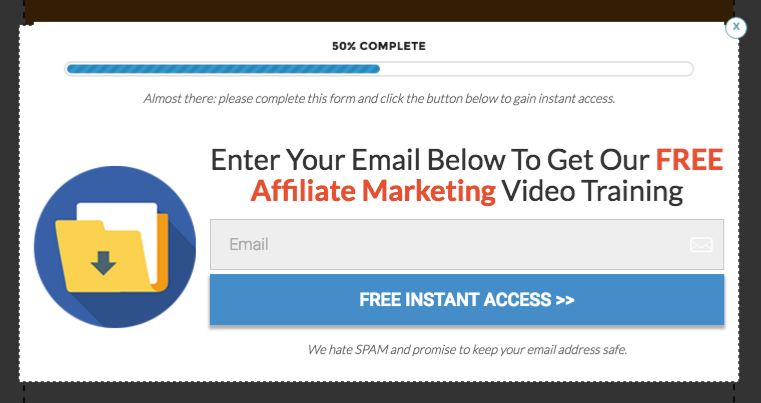 How can you turn that campaign into a repeatable system that brings in X leads every single month? Very few channels and campaigns can be turned into a scalable lead gen engine. It’s not only your job to come up with creative campaigns, you need to find the campaigns that can scale profitably. Most marketers can only think one month at a time, the best [of them] think in years. Adam Connell started Blogging Wizard in 2012 and has, from the beginning, emphasized it as a “community of savvy bloggers [with the aim to] share real-world, actionable tactics and strategies that you can put into action right away.” Focused on blogging and content marketing, Adam and Blogging Wizard have grown into an impressive source for growing your business and mastering blogging for business. 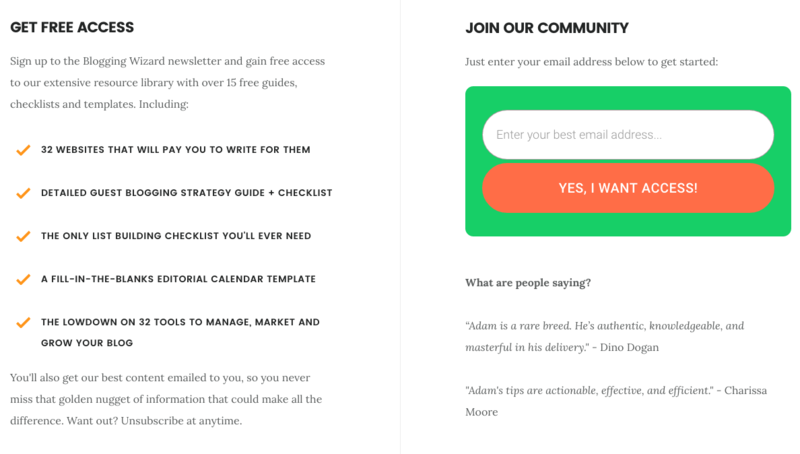 Adam Connell’s website puts subscription front and center. 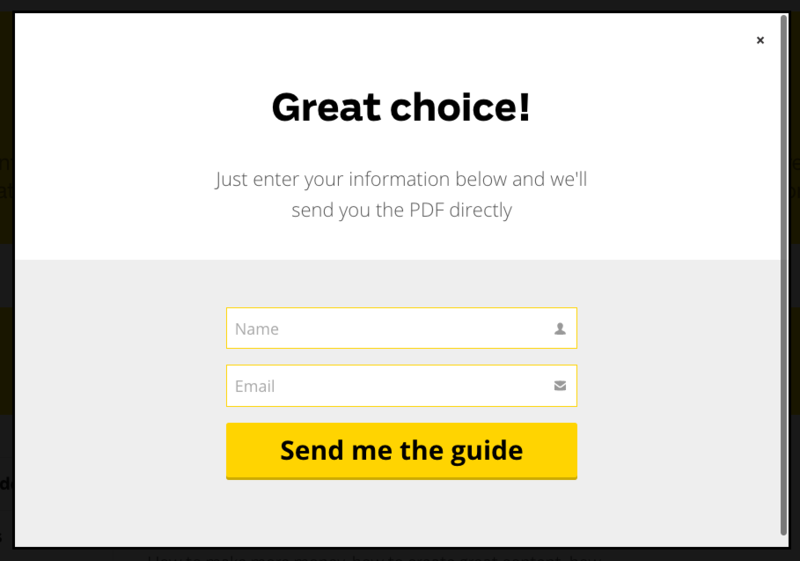 It’s the top CTA of their homepage, sending people down to a benefit list and form. 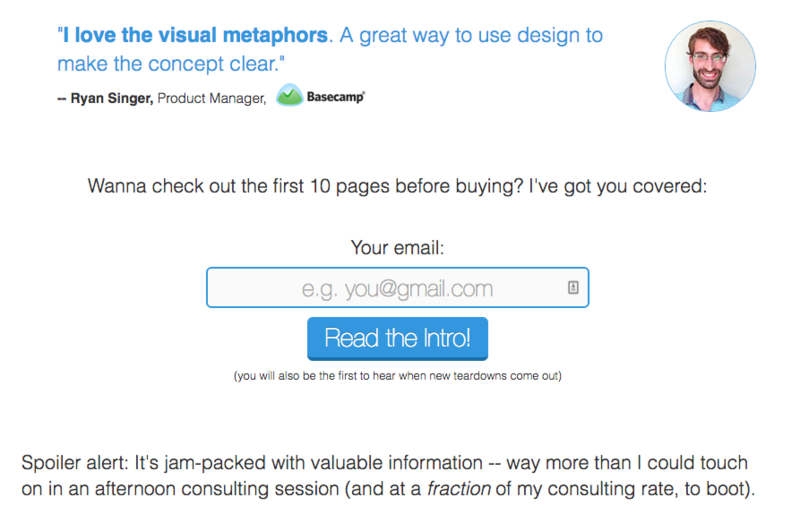 I like the idea of making your homepage into a landing page. Lead magnets have been used for a long time. They’re straight forward, but not as effective as they once were. Content upgrades have the potential for huge conversions, but you have to create something for each post you want to add a content upgrade to. That takes time, and not everyone has the time (or resources), right?! 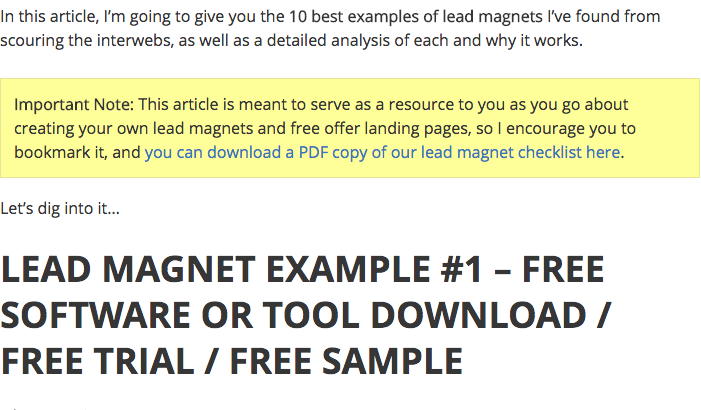 The idea is that you break down the core topics you write about on your website, and create a lead magnet for each one (it’s easier if you keep it to 4 or 5). 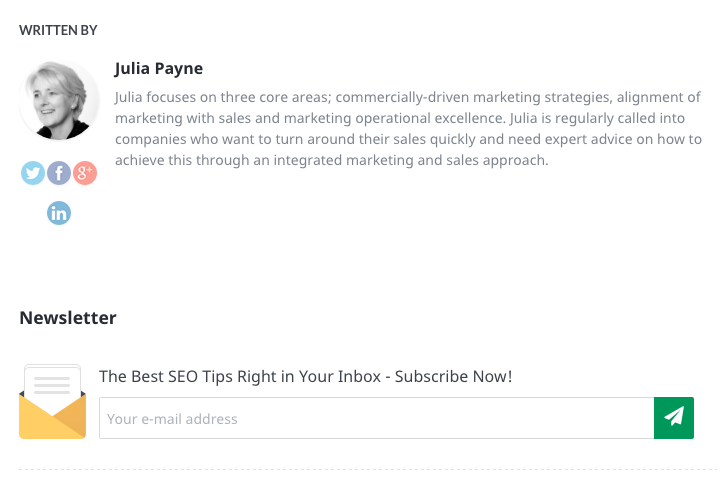 You then display targeted opt-in forms for posts within a given category. 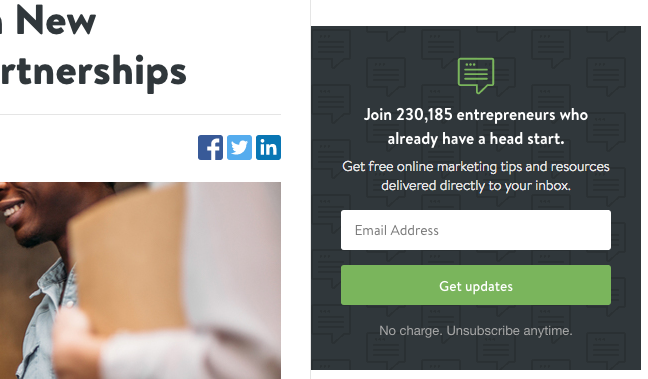 If you were reading about social media marketing tools, would you be more likely to subscribe to get a guide on lead nurturing or social media marketing strategies? But, the technical aspect of this is tricky unless you use WordPress. This is because WordPress has categories, and there are plugins like Thrive Leads that allow you to deploy opt-in forms that are category dependent. 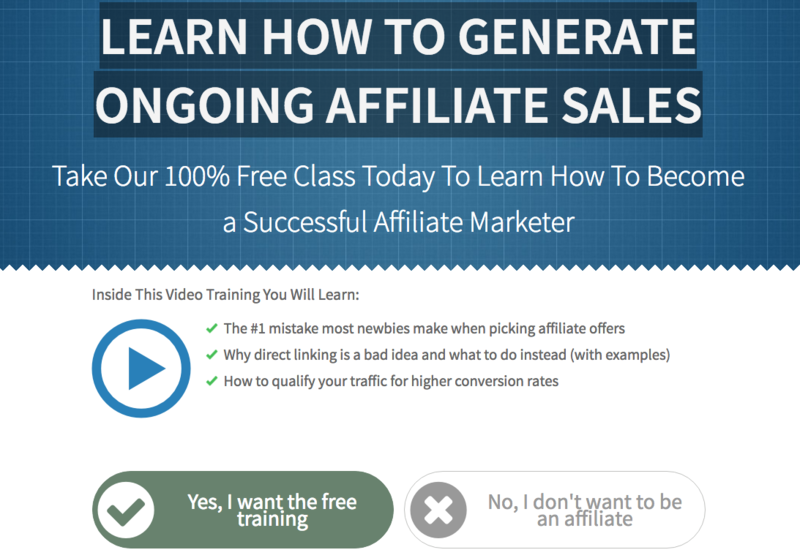 So how much more effective is it versus offering a single lead magnet? 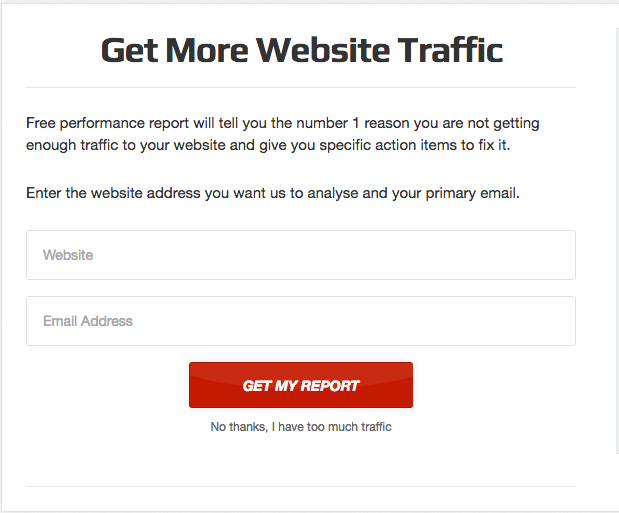 This is something you’d need to test, but after testing this strategy on my agencies website (UK Linkology) – we increased our site-wide opt-in rate by over 300%. And that increase has stayed steady – it wasn’t just a flash in the pan. 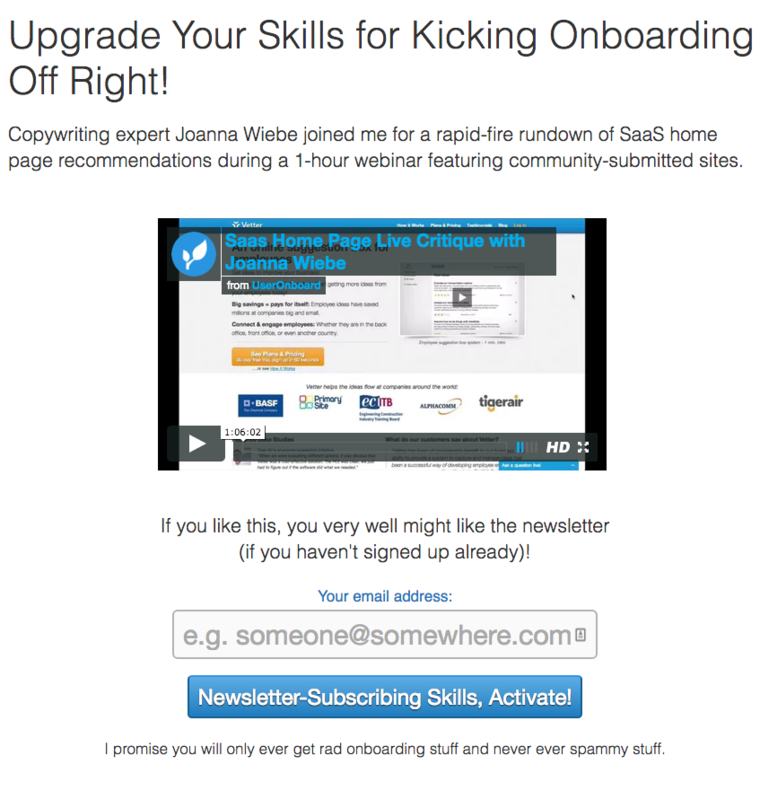 Sure, content upgrades will typically convert better. But this is a great alternative if you want to save time. 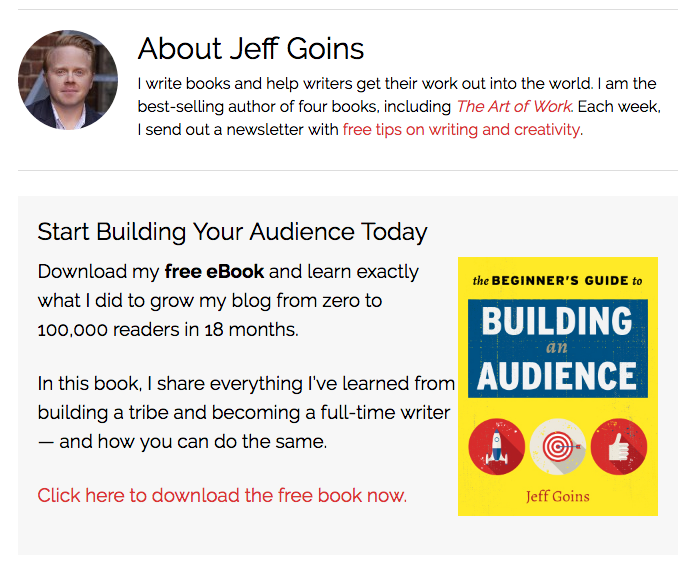 Jeff Goins is the author of four books including the national bestseller (and, on a personal note, one of my favorite books of all time) The Art of Work. On his blog, he muses about writing for a living, writing in general, and the pursuit of living a creative life and making a difference (as well as, of course, driving website traffic). 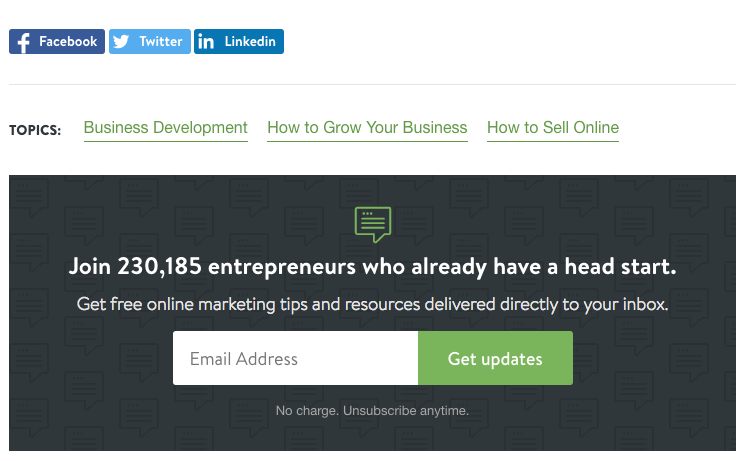 There’s nothing fancy about Jeff’s lead generation strategy. He’s an understated guy. What I like, therefore, is the way his offers are so tailored to his visitor. 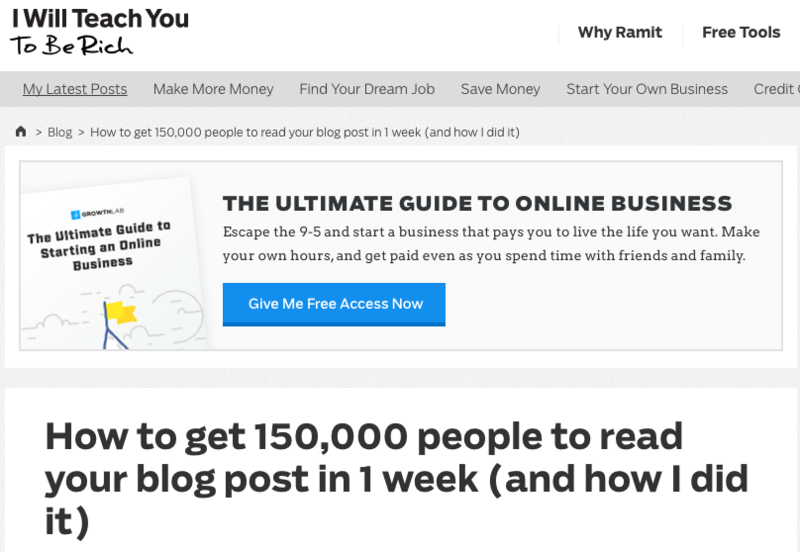 He doesn’t go overboard with “Learn how I made a million dollars this month” but rather “Get everything I did to grow my blog from 0 to 100,000 readers in only 18 months.” It’s very action-based and very tuned into what people are there to learn. 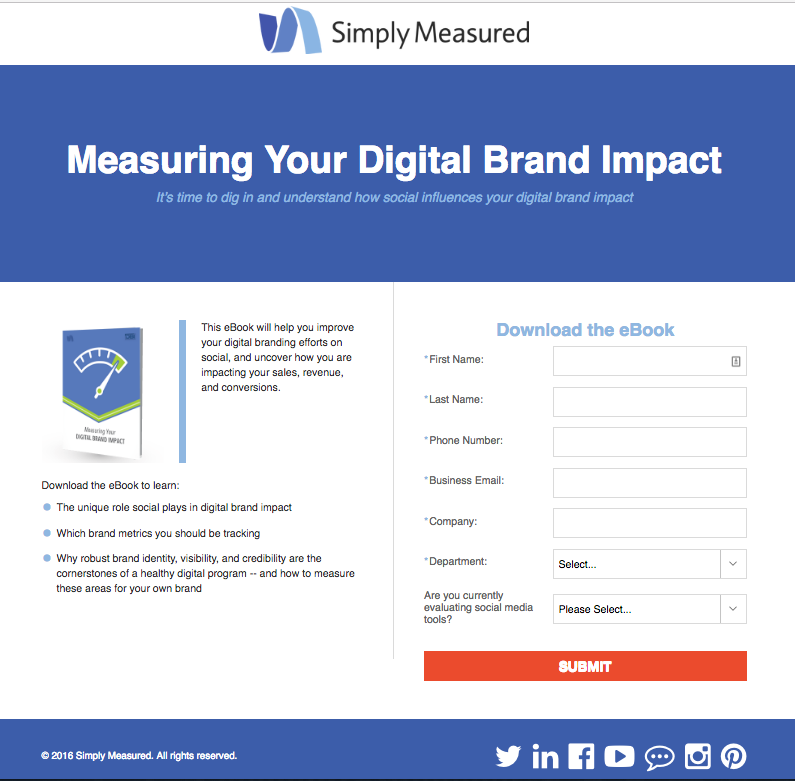 Simply Measured is a social media analytics platform which offers marketers insight from a dozen social media networks. The gated resources provided by Simply Measured are really high quality, and very easy to find on their site. 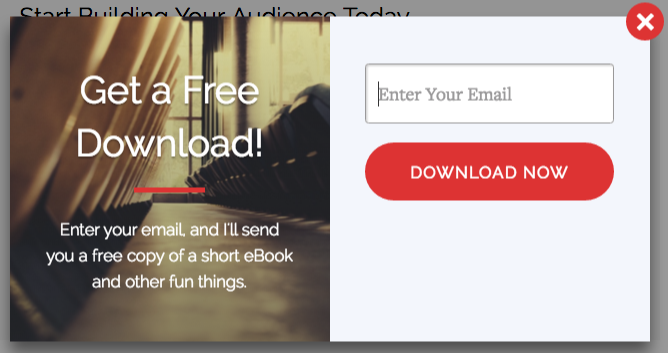 The creation of gated content can be a time-consuming process (though it’s easier if you follow my “Ebook Design Kit for Marketers Who Can’t Design for Sh*t“), but it’s also one of those strategies which, once completed, just sits there generating leads. 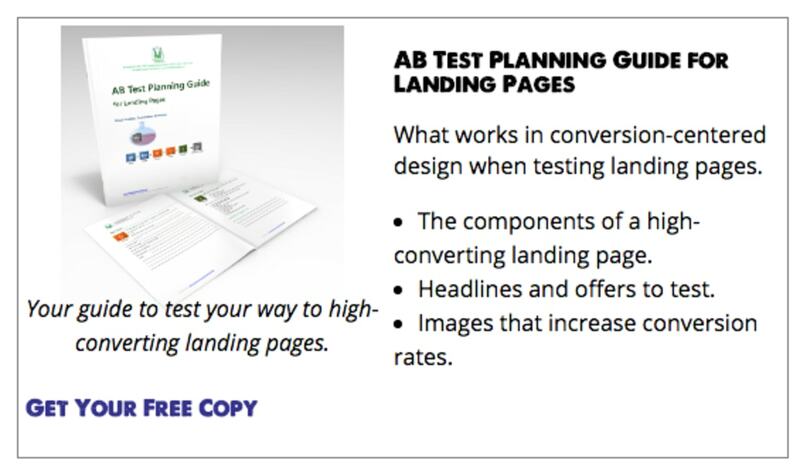 Add some in-line CTAs to your high-traffic articles and from time to time you A/B test a new landing page design, but ultimately, gated content is just a reliable earner. 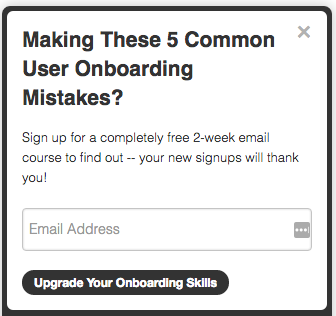 UserOnboard is the brainchild of UX designer and onboarding expert Samuel Hulick. 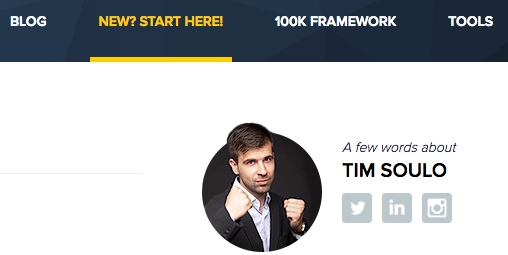 He’s the author of The Elements of User Onboarding. 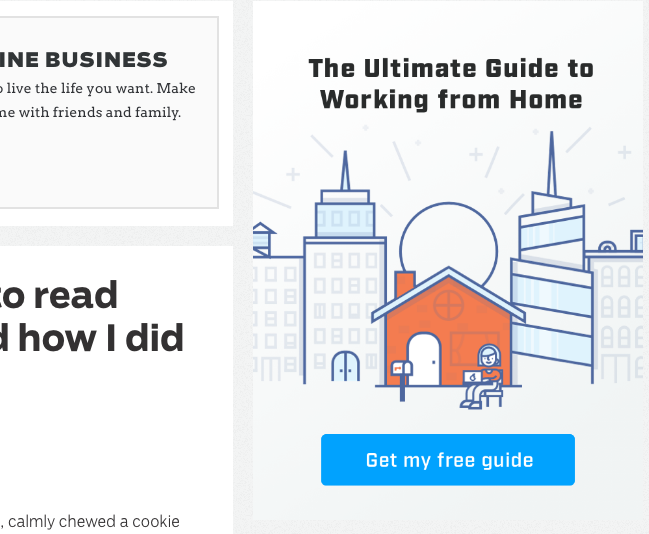 His blog offers his famous “onboarding teardowns” of real-world onboarding examples, and is a go-to place for UX experts and noobies alike to learn how best to turn traffic into conversions or leads into loyal customers through site design. 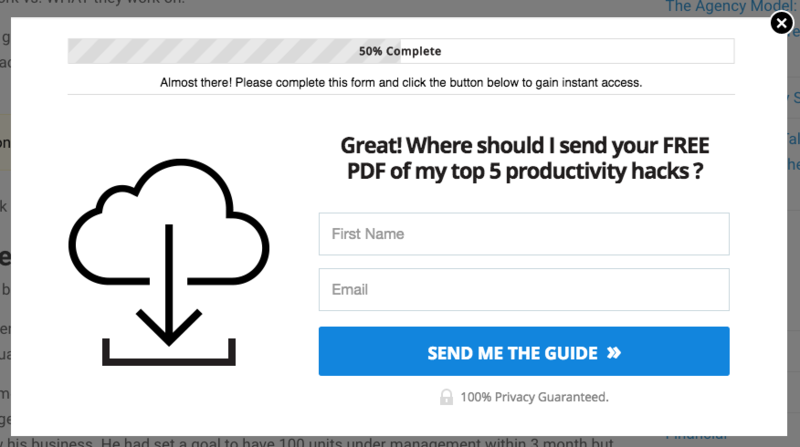 I’m a big fan of both Samuel’s gated book intro (get the first 10 pages if you provide your email address), but if I had to choose I’d go with this post-teardown subscription prompt. 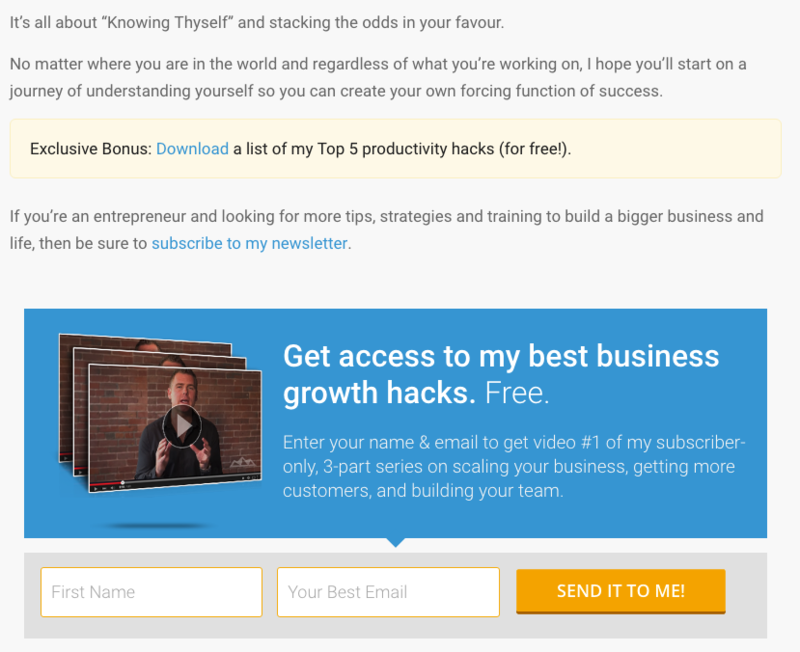 His teardowns come in slidedecks, so you’re making progress through each and getting serious value the entire time (the one I checked out had an awesome point about never putting your gamification progress at 0% so that people can hit the ground running). Subscribing to receive more of the value you’ve gotten doesn’t just seem like a good idea; because it’s on the last slide, it seems like the logical next step as well. 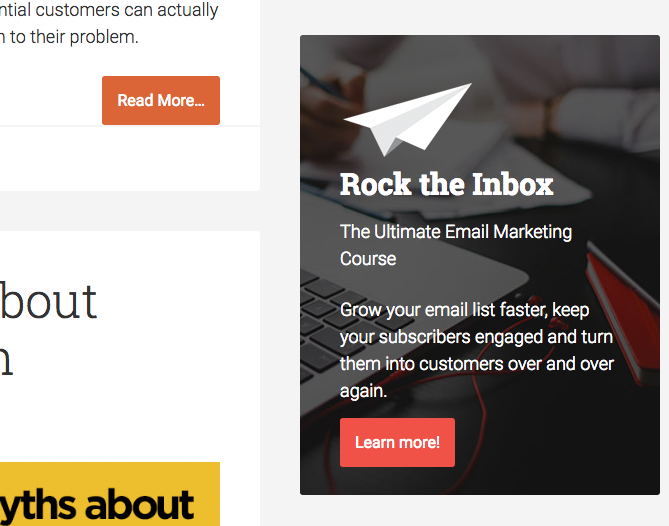 I like the “get notified when this course opens” lead generation strategy. Closing training implies that this stuff isn’t recorded beforehand (a common strategy for marketing training programs) – which increases subjective value. SocialMouths also knows that anyone who does ask to be notified when registration opens is a very qualified lead, and can segment and nurture them accordingly. Petovera was founded by Matt Ackerson. 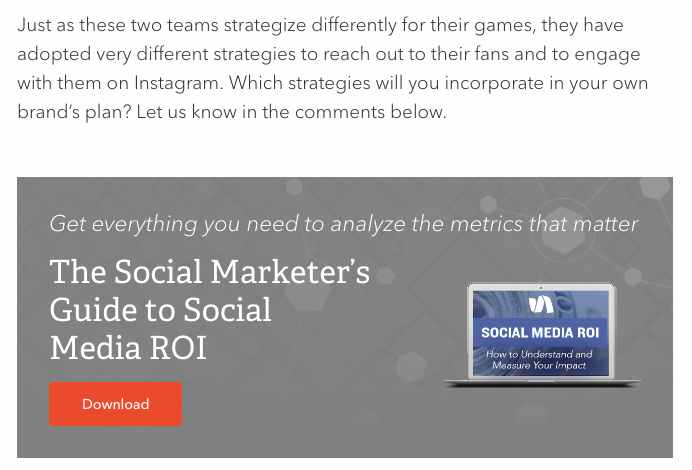 A marketing consultancy, Petovera has been featured in Forbes, Mashable, VentureBeat, Inc and more. The blog focuses primarily on sales funnel optimization. 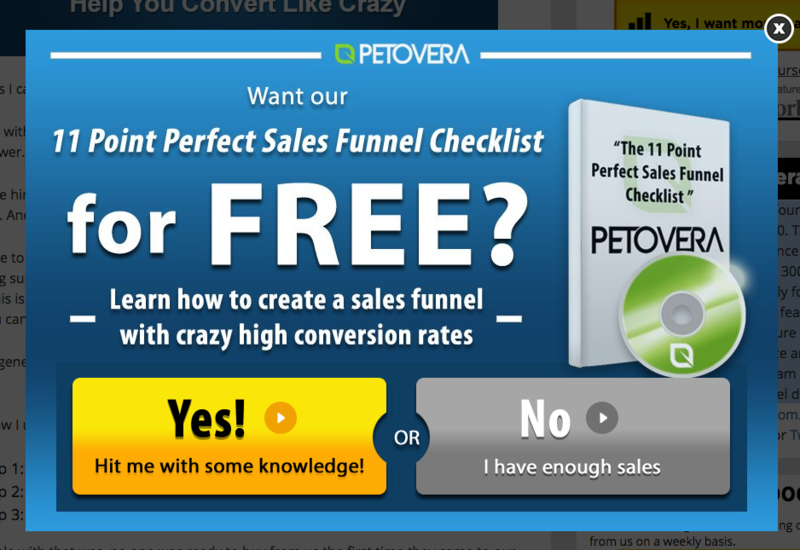 Petovera actually features a lead generation strategy I haven’t seen before – the “gated content prompt through a chat box.” It’s a timed chat popup, which actually supersedes their standard “Do you have any questions?” automated chat. Though its effectiveness is ruined slightly by the “Matt was last active 15 hours ago,” it’s still a very cool way to put content in front of visitors. People are becoming more comfortable buying services online. There’s one problem though: no one cares about your free consultation. Only a trickle of prospects do, at best. The mental switching effort required to commit to a call at a later date, with someone who you think will probably try to sell you, and it’s going to time out of your day… Forget about it. This is why free consultation conversion rates are so low. The solution? Offer a free 10-20 minute video demo of your service and require just an email, or an email and a first name, to access it. 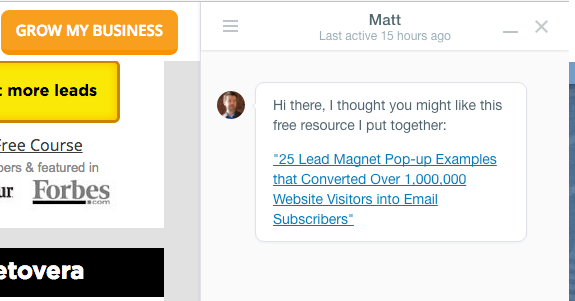 According to one recent case study on Crazy Egg’s blog, this increased lead conversions for a car service business by nearly nine-fold. We’ve also done this for our business, Petovera, and have seen very positive results as well.